"Compositions including 'S' shapes usually create attractive photographs. 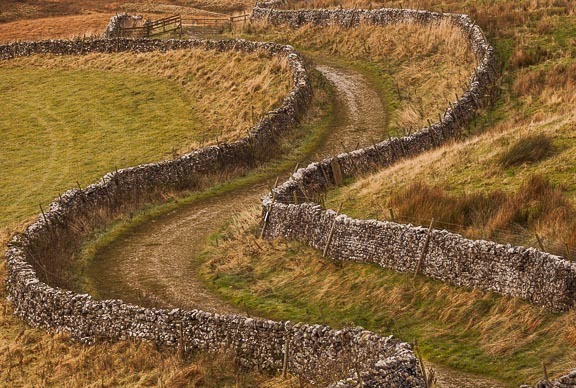 I spotted this winding track whilst on the way to a well known photographic location in the Yorkshire Dales. I positioned myself on a steep hillside overlooking the track to try and obtain the best composition which emphasized its sweeping curves." This photograph was one of the commended entries in the 'Your View' category of the 2015 'Take a View' Landscape Photographer of the Year competition. It was awarded a place in the awards book (available from AA Publishing) and appeared as an exhibition digital display at London Waterloo. Loch Maree Dawn, King Street, and Path to Pen y Fan are commended entries from other years of the same competition.